Easter is the most solemn period in the Roman Catholic calendar and all churches in Italy mark la settimana Santa (Holy Week) in similar ways. Traditionally, on Palm Sunday there is the blessing of olive branches – chosen because palms are hard to come by in Italy – to remember the arrival of Jesus in Jerusalem when palms had been placed on the ground to welcome him. On the Thursday in remembrance of the Last Supper, the priest celebrates mass and humbly washes the feet of twelve parishioners. The Pope himself follows this tradition in Rome, and last year much was made of the fact that Pope Francis washed the feet of refugees, including non-Catholics. Also on this day, after mass all remaining holy hosts and holy water are removed from the church. On Good Friday priests and parishioners undertake the Via Crucis – the Way of the Cross. The procession stops, reflects and prays at the fourteen Stations of the Cross that illustrate Christ’s trial, his walk to Golgotha, his crucifixion, death and entombment. In Rome, the Pope leads a torchlight procession from the Colosseum to the Palatine Hill, with thousands of faithful participating. On this day many practising Catholics fast while others eat fish rather than meat. On the Saturday the priest blesses a beeswax candle – the Paschal candle – that marks the start of the Eucharistic year, and blesses the water that will be used in the church for its various blessings. On Easter Sunday the bells start ringing again (they had been silent since Good Thursday) and the priest wears festive vestments rather than the purple vestments worn throughout Lent as a sign of melancholy. An example of these Easter traditions is found in Assisi. An evocative procession (called La Processione del Cristo Morto) takes place on the Friday morning at which the statue of Christ on the Cross is carried from the cathedral of San Rufino to St. Francis’s cathedral. In the evening, another procession takes place during which Christ’s mother (la Madre dolorosa) is carried to the cathedral to be reunited with her son, after which they are both taken back to St. Rufino. The sombre procession includes hooded bare-foot penitenti (repentants) with thorn crowns on their heads and carrying wooden crosses. 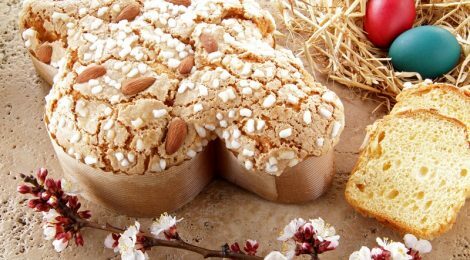 Turning to the more prosaic side of Easter, the traditional cake is Colomba Pasquale (Easter Dove). This is a light cake, like the Christmas panettone, and is in the shape of a dove, which is the symbol of peace in the Christian calendar. In addition to the Colomba, chocolate Easter eggs – normally with a surprise inside – are traditionally gifted and all children look forward to receiving them, both for the chocolate and the surprise. ← Join our conversation groups!